Happy Monday! Anyone else have a hard time getting up this morning? 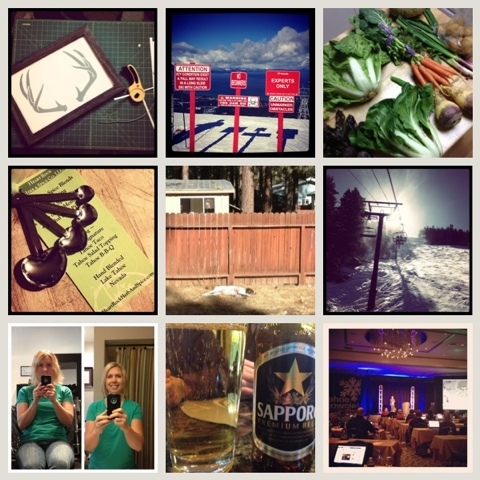 Life in Tahoe has been a bit busy these last few weeks so I though I would recap it though Instagram. If you're not already following me what are you waiting for :) jump over to Instagram and follow me @Tiara_Wasner. There you have it my life lately through my iphone/instagram. Somehow I wasn't following :O I am now though!! yes i can do photos like these too love instagram! surprisingly this dst adjustment didn't affect me at all, i am shocked, normally i feel off but this time nothing! I love the antlers! And so cool that you get CSA veggies...my husband and I have looked into CSA farming a bit, and we'd love to do it someday! Thanks! Now I just have to decide where to hang them.